A full-day excursion with new experiences, beautiful landscapes, historic sights and cultural paths is what you should expect. 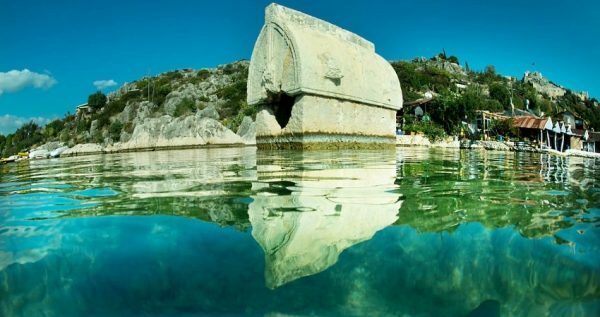 Get to know the culture and the natural beauties of Anatolia and enjoy a boat trip to Kekova. 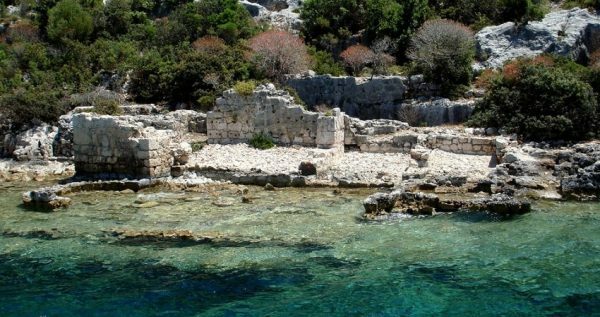 Side Kekova Sunken City Tour is an excursion that has everything you need in order to enjoy a fun, exciting, relaxing and adventurous day. You will be picked up from your hotel by a comfortable bus that will drive you towards the first stop of your excursion. During this 3-hour and 30 minutes road trip, you will enjoy the beautiful surroundings of Taurus Mountains. The bus will pass by the towns of Kemer, Kumluca and Finike. In addition, you will be able to observe some small and picturesque villages. A breakfast stop will also be made near Antalya. Your excursion’s first stop is Üçağız, which is a small sea-side village with picturesque scenery. From there, you will be taking the boat trip to Kekova. 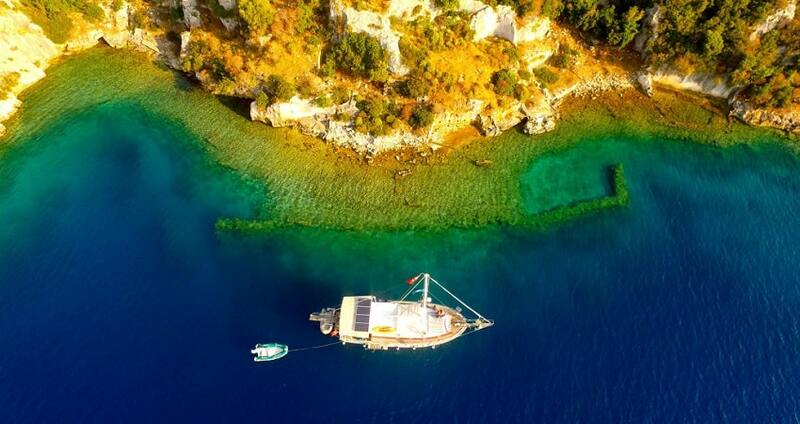 This boat is ideal for an exciting and relaxing boat trip on the crystal clear waters of Kekova. 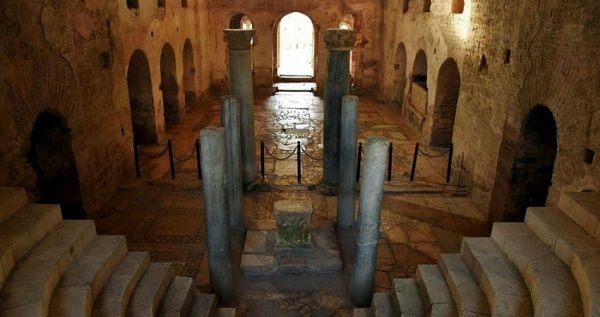 This is because it has a glass floor enabling you to observe the bottom of the sea, as well as the ruins of the ancient city. Snap some amazing photos and be impressed by the amazing colours of the Mediterranean Sea. 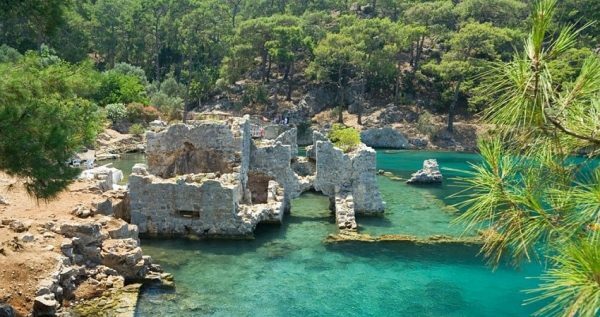 During Side Kekova Sunken City Tour, your experienced guide will provide interesting information about the sunken city and the ruins that you will be able to observe. 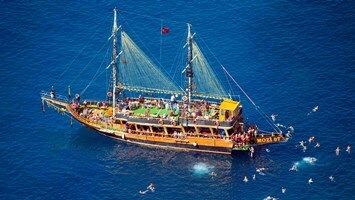 The boat trip towards Kekova Island will have an approximate duration of 1 hour. In between you will get the chance to enjoy swimming in the refreshing and crystal clear waters of Kekova. Once returned back to the port, lunch follows. The lunch will take place at a local restaurant, which is close to the city of Demre. It will be a tasty and freshly made buffet that includes different kinds of salads, soup, rice and pasta. The excursion continues with a short visit at a store where souvenirs and sacred icons are displayed. There, you can view and purchase amazing souvenirs that will make your memories last for a lot of years. The next stop will be made at Santa Claus or Saint Nicholas Church. You will be spending 45 minutes in this popular tourist attraction. Your guide will once again provide a detailed brief that includes important information about the Church. 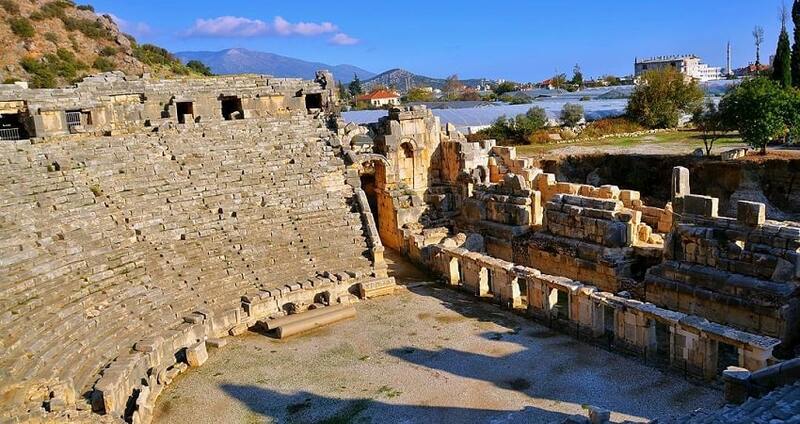 The bus will then drive you towards the Ancient City of Myra for a one-hour touring. The place is famous due to its interesting amphitheatrically architectural design that enables high quality acoustic. 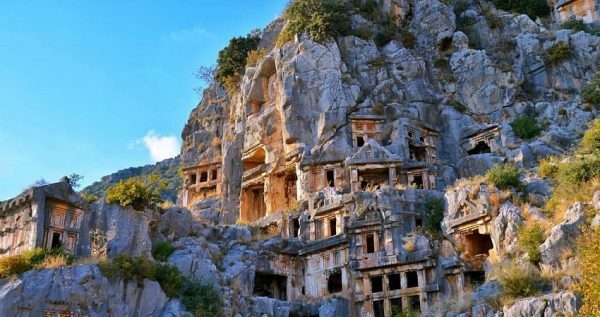 There, you can observe tombs that are carved into mountains and rocks. The excursion ends during the afternoon, once you arrive at your hotel full with beautiful memories. In the bus infants are sitting on the laps of their parents. If you want a seat for your infant, make your reservation as a child. If you’d like to discover uderwater life, Side Antalya Aquarium Tour is the best option. 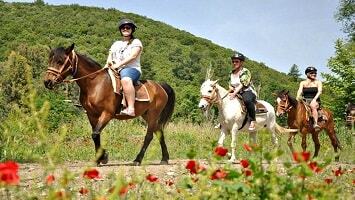 Participate in a full-day excursion that is full of historical sights and picturesque landscapes. Small villages, a boat trip, swimming in turquoise waters and visits in historical places are some of the things that are included in this excursion. Experience both, nature and history with Side Kekova Sunken City Tour. You will be picked up from your hotel in the morning and enjoy a ride of 3 hours and 30 minutes. The bus is modern, comfortable and fully air-conditioned to ensure a pleasant experience. A professional guide will accompanied you in this amazing experience and provide interesting facts about the places that you will be visiting. During the ride you will be able to see some small villages and the natural beauty of Taurus Mountains. Near the city of Antalya, a breakfast stop will be made. The breakfast is included in the price and is the ideal way to feel refreshed and relaxed after a long bus ride. 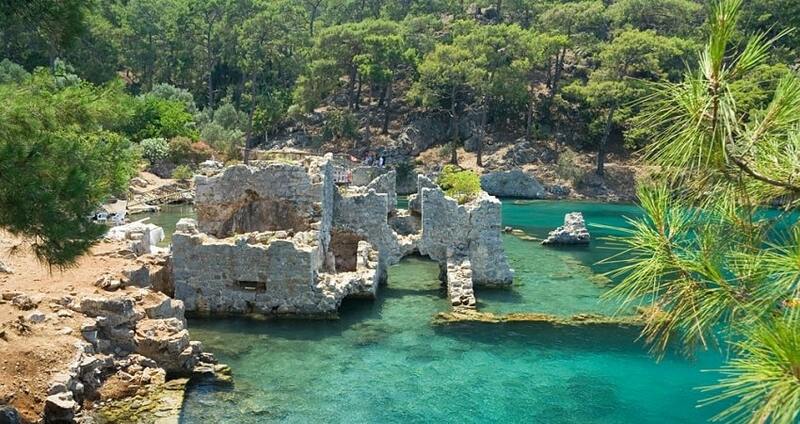 In Side Kekova Sunken City Tour your first stop will be made at the sea-side village of Üçağız. From there you will take a glass bottom boat for a trip to Kekova Island. You will be able to observe and take some pictures of the sunken city and of the ruins. At the same time, your guide will let you know important information about that city. 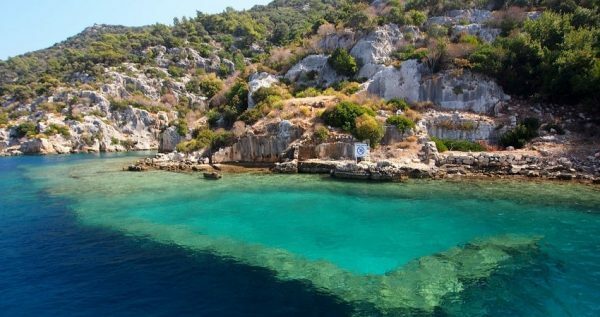 Moreover, you will get the chance to swim in the turquoise waters of Kekova. The boat trip will last for about one hour. Once you reach the pier, the bus will drive you towards a local restaurant. There, you will have the opportunity to enjoy a buffet lunch that includes a variety of salads, rice, soup and pasta. 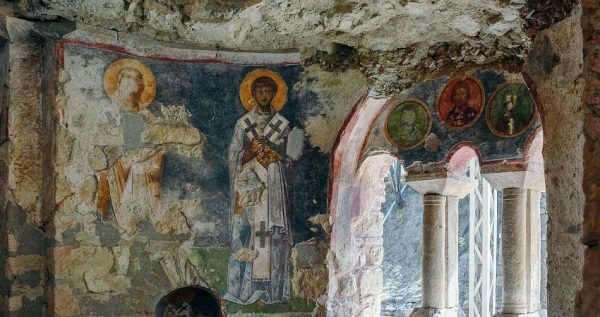 The excursion continues with a visit at Saint Nicholas or Santa Claus Church. This famous spot is among the most visited places from both, locals and tourists. You will be spending 45 minutes there as your guide will explain everything you need to know about that place. Except from its religious importance, this place has also great architectural design, icons and mosaics. 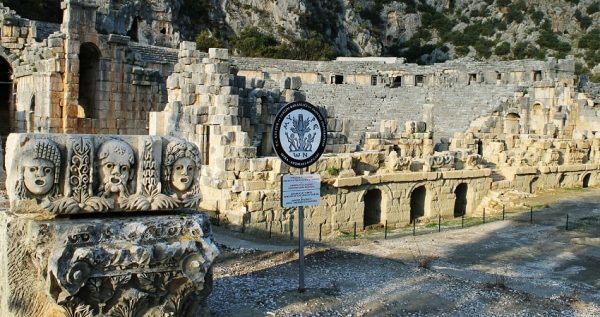 The final stop of the excursion will be made at the Ancient City of Myra. Within the one hour that you will be spending there, you can observe the interesting architecture of the place. In fact, due to the fact that the city is amphitheatrically built, it allows high quality acoustic. The Ancient City of Myra has a number of tombs that are carved into rocks and mountains. Once your last stop is over, you will head back to the bus for your return. The excursion ends during the afternoon by the time you arrive back at your hotel.